If you are looking to store your belongings in Shelton, CT, you should know that you have more options than settling for a self-storage facility. What if you could have somewhere close to your home or business that provided you with the space you require that was both secure and affordable? That’s precisely what we offer at A.B. Richards; competitively priced portable storage container rentals for your convenience. When you get in contact with a representative at A.B. Richards we will work with you to decide the best storage container for your needs and we find out where you want that container. Our trained drivers will deliver it directly to your specified location and then you use it for as long as you need it. When you are finished with what you need it for, just give us one more call and we’ll send a trailer to pick it up from the location at no extra cost to you. It really is just as simple as that! 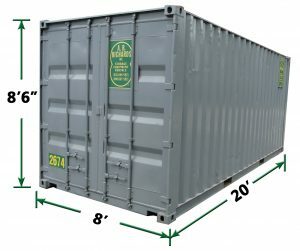 Fill out the form or call us at (800) 597-5971 to rent storage containers in Connecticut today! In order to best accommodate the project sizes of all our clients, we provide our three different sized storage containers for the people of Shelton, CT. The first of these is the 20ft storage container. This option has often been popular among our homeowner and small business owner clients as it provides 149 square feet of room making it ideal for making space for renovations or additional record storage. 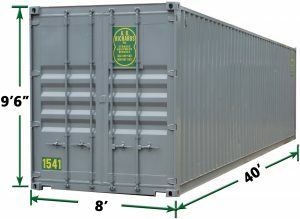 The next container in our line of products is the 40ft storage container. More than doubling the available area at 304 square feet, this option makes the most sense for people who run a store or warehouse and need some temporary space to store excess inventory while they clear the existing stock. Finally, the last of our containers is the 40ft Jumbo container. Giving you an additional foot of overhead room, this container is usually chosen by those who have larger-than-average storage needs or those looking to securely store away equipment like a standard sized forklift which fits in this option with ease. As always our storage solution experts are ready for your call to help you out with any questions or concerns you might have. So if you need storage space in Shelton, CT call A.B. 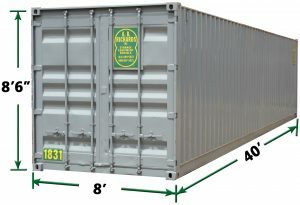 Richards to see how our storage containers can help you with your project needs.